This story takes place around the 1960's, when switchblades were legal, kids smoked when they were nine or ten, and Mustang cars and drive-in theaters were popular. Ponyboy Curtis is a greaser. Greasers get their name from the grease they use to slick their hair back. They're poorer than middle class, smoke a lot, get into trouble from time to time, and get into fights with the Socs. Socs are the rich, upper-class kids. They drink beer, throw wild parties, and drive fancy cars like Mustangs (yes, back then a Mustang was a fancy car). But for some Socs, a favorite activity was to jump greasers. When I say "jump," I don't mean playing leapfrog. I mean four or five kids pile into a car, find someone else from the other side of town, and beat them up. Ponyboy, a 14-year-old boy, is walking home from a drive-in theater when he gets jumped. The Socs who jump him only run away when they hear Ponyboy's brothers come running. Ponyboy has two brothers: Sodapop and Darry. Sodapop is 16-going-on-17 and has a great sense of humor. He dropped out of high school to get a job. Darry is around 17 or 18 and works roofing houses, so he has big muscles and is really athletic. Life is tough at home for Ponyboy; he constantly gets into fights with Darry, when Darry is home. Darry and Sodapop both work full-time jobs to support the family. One evening, Ponyboy and his friend Johnny go to a movie at one of those drive-in theaters, and end up sitting next to two Soc girls, Cherry and Marcia. When the movie ends, Ponyboy and Johnny offer to walk the girls home. While they are walking, a blue Mustang pulls up beside them, and two Soc guys get out. These two guys just happen to be Cherry and Marcia’s boyfriends, and these guys are mad at the two greasers for "picking up" their girls. Cherry and Marcia decide to head home with their boyfriends before a fight breaks out, leaving Ponyboy and Johnny standing there. They walk back to the lot of the drive-in, lie down in the grass, and chat for a bit. They fall asleep. When they wake up, it is two in the morning, and when Ponyboy gets home, he gets into a fight with Darry over his being out so late. Darry hits him in anger, which no one in Ponyboy's family has ever done. Ponyboy runs away, finds his friend Johnny, and together they run to the park. There, they get jumped by the same Socs who came up next to them in the lot of the drive-in. The Socs try to drown Ponyboy in the park fountain, but when Johnny stabs one Soc with a switchblade, the rest of them go running. Johnny has killed someone, and that "someone" turns out to be Cherry's boyfriend. The boys they run for it. Soon the cops will be after them. The Outsiders is "a heroic story of friendship and belonging," and a true classic. (And the author was 15-16 when she wrote it!) Ponyboy lives in a world where society defines you as a good or bad person according to things like how much money you have, what type of car you drive, if you even have a car, etc. Society expects everyone to be like a Soc, rich and sophisticated. If you aren't, then you are branded a greaser, and everyone shuns you. And simply because Ponyboy is a greaser, society sees him as a criminal, though he's not. He's an intelligent young man who is kind to others. But in his world, money and cars are valued over kindness, intelligence, and love. This book gives us a strong example of how other people's views affect you, and everyone around you. The Socs jump Ponyboy and Johnny because they are greasers, but there are moments in the story when some of the Greasers and some of the Socs try to talk and get to know each other a bit, understand each other. a.) The book is loaded with wonderful anachronisms that are far more alien to today's 10-15 year-olds than they were to the same age group in my day. Talk of switchblades and rumbles and Ford Mustangs and drive-in movie theaters evoke for me a quaint Grease-like atmosphere. But I wonder if for kids today, this might be little different than reading Shakespeare - words and phrases and places and references for which they have little context. 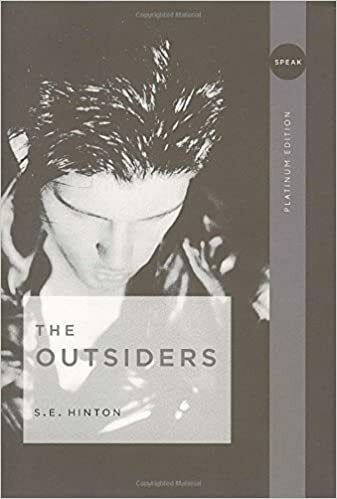 In that sense, The Outsiders is a period piece, unique in that it takes place in a period about which the parents of the child reader can actually say, "Yeah, I remember that. I was there, let me tell you about it." b.) The book has been frequently banned or challenged in school districts all over the country. No, really. It is apparently in the banned books all-time top-50. Insane, IMO. Still, if you decide that your child isn't ready for The Outsiders, I can strongly recommend Trino's Choice, by Diana Gonzales Bertrand. It has a similar storyline and theme(s), and features a 7th-grade protagonist that many kids will associate with. Slightly shorter, and targeting a younger audience, the book is equally as literary, and significantly less violent, while focusing a little more on positive role models (a chief criticism of The Outsiders).